When the user click on the pop-up button or on the background the pop-up will be hidden and not will be shown again. Note: You can configure the pop-up button text through the Daily Login Rewards settings page. 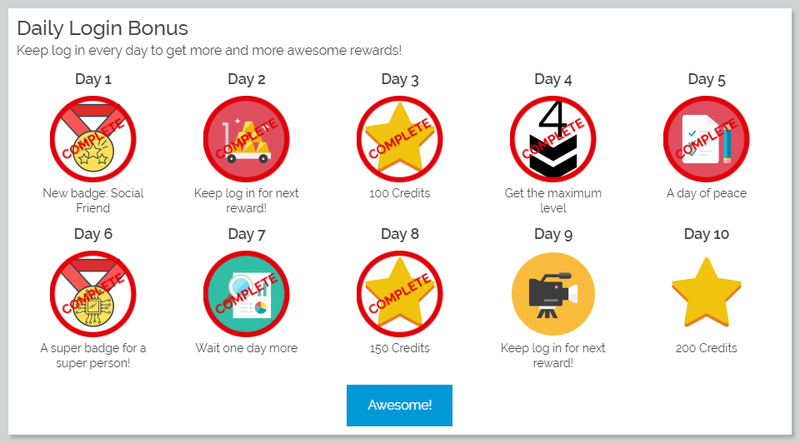 Note: You can configure the stamp image through the Daily Login Rewards settings page. You can configure multiple rewards calendars to be shows on pop-up, Daily Login Rewards has support for that and user will see a pop-up after another until get notified of everyone. For testing the pop-up utility you can enable the multiple log in feature through the Daily Login Rewards settings page, so you will be able log in and log out multiple times and being awarded for every time you log in in the same day. Important: If you are getting issues with multiple log in, check this page for troubleshooting. If you are styling the pop-up, and you want to see the pop-up every time you refresh the page, just don’t click the pop-up button or outside the pop-up window. When both of this clicks are perform, the add-on removes the pop-up to being shown again and just will be shown next time you get rewarded.